Who (and when) discovered first that the Moon does not have its own light? 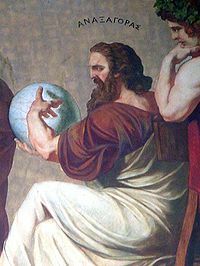 Anaxagoras brought philosophy and the spirit of scientific inquiry from Ionia to Athens. His observations of the celestial bodies and the fall of meteorites led him to form new theories of the universal order. He attempted to give a scientific account of eclipses, meteors, rainbows, and the sun, which he described as a mass of blazing metal, larger than the Peloponnese. He was the first to explain that the moon shines due to reflected light from the sun. He also said that the moon had mountains and believed that it was inhabited. The heavenly bodies, he asserted, were masses of stone torn from the earth and ignited by rapid rotation. He explained that, though both sun and the stars were fiery stones, we do not feel the heat of the stars because of their enormous distance from earth. He thought that the earth is flat and floats supported by 'strong' air under it and disturbances in this air sometimes causes earthquakes. The sun is a mass of fiery metal, and the moon is an earthy lump (with no light of its own). The citizens of Athens ... passed a law permitting impeachment of those who did not practice religion and taught theories about 'the things on high'. Under this law they persecuted Anaxagoras, who was accused of teaching that the sun was a red-hot stone and the moon was earth. Anaxagoras proposed that the moon shines by reflected light from the "red-hot stone" which was the sun, the first such recorded claim. Showing great genius he was also then able to take the next step and become the first to explain correctly the reason for eclipses of the sun and moon. His contributions are also discussed in a biographical page in about.com's astronomy portal. A world in the moon? In Ancient Cultures - How was a New Moon identified when it can never be seen?